Is there a better alternative to Image Effector? Is Image Effector really the best app in Photography category? Will Image Effector work good on macOS 10.13.4? Image Effector is a versatile application for enhancing your pictures. Apply the effects and use the editing tools for making unique images. Share them with your friends or use them for your photo albums, presentations and many other projects. 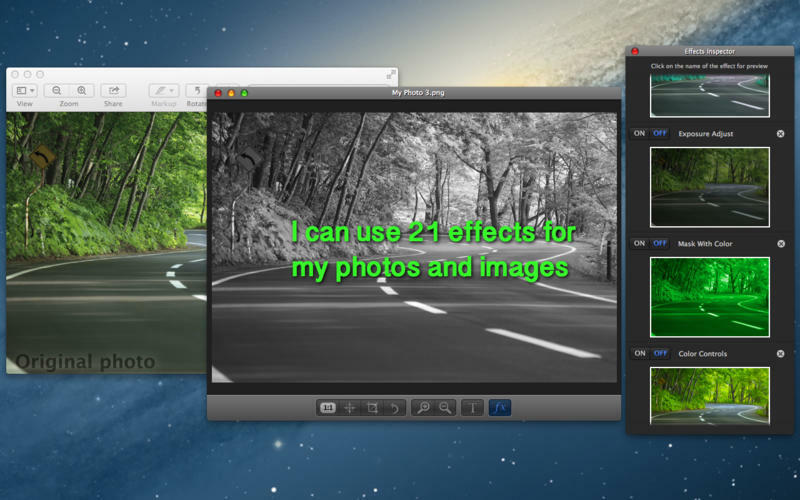 Image Effector has some powerful effects and is very simple to use. Import PNG, TIFF, JPG, PSD, ICNS or GIF format pictures into the application. Choose various effects and filters. Add text and use editing tools to finalize your photo. Share your images or use them for personal projects. Image Effector needs a review. Be the first to review this app and get the discussion started! Image Effector needs a rating. Be the first to rate this app and get the discussion started! Adjust color and Image: Black and White, Hue Adjust, Exposure Adjust, Mask with Color, Color Controls, Sepia, Color Invert, Highlight Shadow, Vibrance. Stylize: Bloom, Line Overlay, Edges, Edge Work, Crystallize, Pointillize. Blur: Gaussian Blur, Motion Blur, Zoom Blur, Box Blur.